Alfred Angelo and Disney Consumer Products celebrate the release of Disney’s Cinderella Diamond Edition, available on Blu-ray™ for the first time this Fall, with a one-of-a-kind Cinderella– inspired bridal collection. This unique line of limited-release wedding dresses consists of five exquisite styles in soft shades of blue. Each gown represents the iconic Disney Princess character from a unique point of view, including timeless ball gowns that sparkle with every turn, and modern fit and flare silhouettes that look as if they were bathed in moonlight. The Cinderella Diamond Wedding Gown Collection will be unveiled initially at Chicago Bridal market on September 29, 2012, where bridal shops and industry press will get the first view of the collection. The Cinderella Diamond collection will make its runway debut on October 12, 2012, at a press-only show during Couture Bridal Market in New York City. 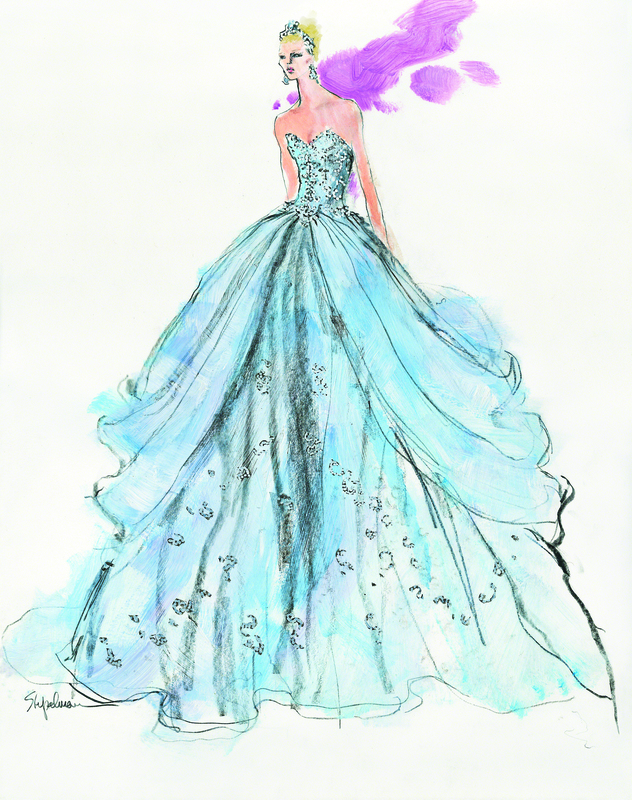 Beginning in October, the Cinderella Diamond wedding gowns will be available to brides through special engagement bridal trunk shows to be held in Alfred Angelo Signature Stores and Alfred Angelo Partner Stores in the US, Canada, Australia and the UK that carry the 2013 Disney bridal line. For tour dates and locations, brides can log on to alfredangelo.com. The “Glass Slipper” blue fabric is perfect for brides who embrace subtle color for their wedding. But, each gown is also offered in ivory and white for brides with more traditional tastes. For more information please visit: www.alfredangelo.com/Disney or www.disneybridal.com. The Cinderella Diamond Edition Blu-ray will be available October 2nd. In these trying economic times, it’s to stop – look and enter every contest you can for your wedding. The cost to you (as the bride and groom) is pretty crazy, but it can be the same way for your bridal party. You know…gifts, parties, showers… it adds up! So every week in August one bride will win their bridesmaids party absolutely free from Alfred Angelo! You can select up to six bridesmaid dresses for your wedding party, from their collection of 55 colors! Did I hear squeals of joy?? Question: Have the place, what about bridal party, diets and registry – Oh My! Your earlier note was most helpful and we’ve already begun to take your advice. We’ve decided to get married at Westminster Abby and while I would have loved to have just run off with him…you know a proper destination wedding, Wills family knows a lot of people. Actually we also have a lot of friends and we wanted to have them attend too. Thank goodness I’ve already had help with seating. What we’ve found ourselves wondering is, what sort of things our bridal party should wear? It is going to be formal and our parties are all sorts of sizes. No one size fits all here. With the short notice, even if one of them did want to diet there simply isn’t time. I want my girls to be comfortable and chic. We’ve also had people say “where are you registered?” Frankly, we have lived with each other for several years and have set up our home. We don’t really need many things that we can’t afford to get ourselves, but I don’t want a crazy lamp that will clash either. How do we do this? Oh, I must dash now. I’m doing a run through with my brother-in-law Harry, because Will is at work and can’t make it. Thank you once again. Dearest Kate…it is ok if I call you Kate right? Do call me Lisa. I love helping brides find the vendors that can best help them in their search and wish to create the perfect wedding day. I’m thrilled to hear that you have chosen Westminster Abby. Did you know that it is one of the oldest churches in London? There’s also great shopping just down the road (I’ve been there, done that!). Choosing your location will set the tone for everything from your invitations to your dress. So you can have it all in one location (if that’s easier or more cost-effective) or you can have it in different locations. With that said, make sure that if you have your ceremony in one place and your reception in another, you either offer directions or transportation for your guests. A wonderful double-decker would be great, a trolley (if a large garden) or even a party bus. I want to applaud you for choosing people for your wedding party and ACCEPTING them for whatever size they are. I’m so tired of girls starving themselves to be what people ‘think’ they should be on their wedding day. However with that said, if they choose and have time to ‘trim up a bit’, then do it properly. Weight Watchers has a new program that helps manage your weight with a healthy eating plan and promoting exercise. Lots of gyms have programs specifically dedicated to weddings; to target those specific areas. Remember NO CRASH DIETS HERE!! There are several designers that have wonderful bridesmaids attire like Priscilla of Boston, Alfred Angelo, Jenny Yoo and Simone Caravilli that carry sizes from 0-36 (not all designers go to 36, but surely to 16). They are chic, stylish and dresses that your girls can and will want to wear again. I will also say that Two BirdsMaid also have lovely dresses and I do believe are the most versatile. Why, you can buy one dress and it can be ‘wrapped’ in 15 different versions. This gives your girls the option to ‘custom-fit’ their dress. I’m sure you will find dresses for your girls that will allow their personality to shine, give a proper fit and befitting for your wedding vision. I would strongly recommend that you perhaps…just pick the designer and color and let the girls pick their style. This will make things lots less stressful for you as some will want to have more arm coverage, more bust-line coverage or not feel comfortable in a short dress. I think the “Where are you registered” question is the third asked question after “How did he propose” and “Have you set a date yet”. Registering for your wedding is always a good idea. After all, you don’t want three microwaves or a crazy “Rainforest sound” machine” (unless you like that sort of thing). Most couples should find a store that is nationwide (for those relatives that live far away and for grandma who may not have a computer and wants to physically go and buy something) and register for a range of things at a range of price points. So get your china (or just pretty dinnerware), perhaps that new coffee system you’ve had your eye on. Some shops like Crate and Barrel, William Sonoma, Macy’s, or Nortstrom offer a good selection. There is also Newlywish.com which offers everything from cookware, dancing lessons, museum memberships and sporting and cultural events. You can also forgo this all together and ask your family and friends to give to your favorite charity or a great cause. It sounds like things are shaping up nicely Kate. I’m so pleased for you. I’m here and available should you have any other questions. Just feel free.